Scriber thinks the adult Trumpists of this generation, themselves prone to the Dunning-Kruger syndrome, are raising the next Dunning-Kruger generation. The parents are modeling, and the kids are learning, how to not know what they don’t know. Let’s track that process by looking at the behaviors of kids and their parents at Trump rallies. 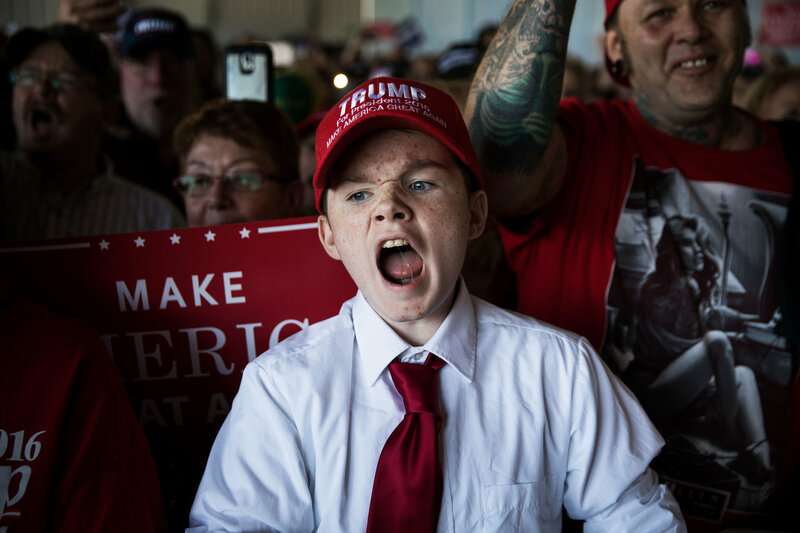 Damon Winter, staff photographer at the New York Times documents The Children at the Trump Rallies. What is it like to see young people exposed to so much anger? Heartbreaking, says a Times photographer. During the last few weeks of Donald Trump’s presidential campaign in the fall of 2016, I found myself seeking out increasingly tender and empathetic photographs of his supporters. Maybe it was the long weeks away from my own son that softened my eye and drew me toward parents and their children at Mr. Trump’s rallies. It’d been a long journey covering the campaign, and I remember being exhausted by the anger I experienced. The crowds took Mr. Trump’s lead and directed their hatred at me and my colleagues from the press, event after event, day after day, and, eventually, it took a toll. Nearly 19 months after Mr. Trump took office, I photographed my first Make America Great Again rally on Thursday in Wilkes-Barre, Pa. It felt eerily familiar. The staging, the music, the lighting, the faces in the crowd, the metal cage that confined the press, and even the wording of the opening announcement urging supporters not to hurt any protesters, were all the same. The journalists I had befriended on the campaign were all there. The jarring difference in this all-too-familiar setting was that “president” now preceded the former candidate’s name. The Make America Great Again rally in Pennsylvania on Thursday echoed the hostility of campaign events during Donald Trump’s run for president. President Trump devoted most of his time at Thursday’s rally to denouncing the news media. The hostility against the media at the rally was palpable. Winter observed that “children were exposed to this anger, were learning from it and participating in it.” The kids, Scriber thinks, are also learning not to know what they don’t know. They are also learning from Faux News, via their parents, how to overestimate what little they do know. That in a nutshell is the Dunning-Kruger effect. In Part 2 of this series, we’ll explore the Dunning-Kruger syndrome in more detail.